A youthful looking Alfonso X, el Sabio from the Book of Games (1283). Alfonso X, king of Castile-León from 1252 until 1284, figures prominently in Spanish history more for his cultural achievements than his political judgment. He recognised the need to unite the disparate Christian communities that he inherited from his father, Ferdinand III of Castile-León. However, his political goal of administrative reforms and his ambition to become Holy Roman Emperor proved beyond his grasp. He ended up alienating the nobility and towns, deposed by his son, Sancho, and abandoned by his family. Political failure, however, was more than compensated by his contribution as a scholar (hence his honorific title el Sabio: the Learned) in three fundamental areas vital for the identity and cohesion of a nation: language, law and history. In this he probably did more to establish the groundwork for a unified Spanish state than anyone before the Catholic Monarchs, Ferdinand and Isabel, ruled 1474-1516. As a scholar, Alfonso valued intellectual accomplishments whatever their source, and in the Iberian Peninsula he could draw upon his own Christian, Roman and Visigothic legacy as well as the wealth of Islamic and Hebraic traditions. His radical contribution was to disseminate with the authority of his royal status the wisdom of these multilingual legacies to his people in Castilian rather than Latin, the universal language of the time, used in diplomacy, education, business, and by the Church. Amongst Alonso’s contributions, too, were commissions to translate scientific and literary works from Arabic or Latin into Castilian. The translation enterprise was vast and carried out in Toledo (already an established centre for translations, but up till then into Latin) and Seville, Alfonso’s favourite city. Alfonso’s decision to advance Castilian into these fields helped to enrich the language immeasurably. Suddenly exposed to new ideas and new demands, the Castilian language acquired greater syntactic flexibility and a much wider vocabulary as it borrowed abstract, scientific and legal terms from Arabic or Latin. These were fundamental steps in elevating Castilian, and by extension an important step in making Castile synonymous with Spain. 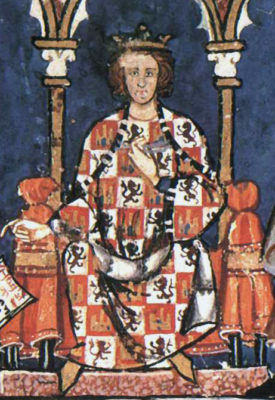 Alfonso’s father, Ferdinand III, had already set the trend, by using Castilian in his public record documents. But Alfonso went further. He made Castilian the working language of his court, becoming one of the first European monarchs to elevate so completely the vernacular tongue. By replacing Latin with Castilian, then, Alfonso was using language as a unifying factor towards the creation of a national identity, with strong patriotic overtones, at a time of fluid boundaries, internal uncertainties and external pressures. However, Alfonso’s privileging of Castilian over Latin should not be seen in isolation. It was part of a wider cultural phenomenon whereby the vernacular was gradually asserting itself in the face of Latin at a time when scholarship was increasingly secularised and challenging the authority of the Church as the source of learning. Already in the early years of the 13th century, Alfonso’s great grandfather, Alfonso VIII of Castile, had founded the largely secular University of Palencia, ca 1204. Early products of this climate of secularisation were the anonymous Libro de Alexandre (The Book of Alexander) and the Libro de Apolonio (The Book of Apollonius), both inspired by earlier works in Latin. By this time, Castile’s most famous epic poem, the Cantar de mío Cid had been composed (around 1200) and the first known literary author in Castilian, the poet-cleric Gonzalo de Berceo (1196?-1264?) was composing a series of poems –the best know being the Milagros de nuestra Senora (The Miracles of Our Lady)— between roughly 1220 to 1260. Another contemporary poem in Castilian was the anonymous Poema de Fernán González (ca.1250) about the founding hero of Castile. The point is that topics earlier written in Latin –epics, religious works– were now rendered in Castilian, even though –as was most likely the case—the authors of these works were members of the clergy and educated in Latin. This transformation suggests that Castilian was coming of age, and was now able to compete with Latin as a medium for learning (e. g. the Alexandre deals with the life of Alexander the Great, and his education as well as his military exploits) and for propaganda (e. g. the Milagros is meant to inspire devotion for the Virgin). Like language, law is a potent means towards unity and identity, as the Romans and Visigoths had discovered. 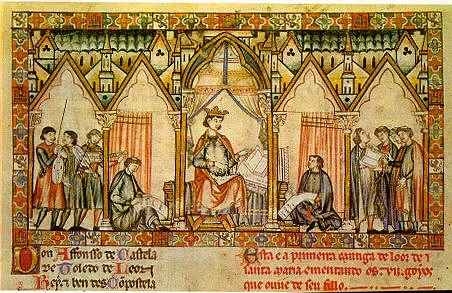 Following the chequered advance of the different Christian kingdoms over hundreds of years, there was a pressing need to reform the chaotic state of the law in Castile derived from various sources, e. g. the Visigothic Fuero Juzgo (Code of Laws), municipal fueros (charters) and common law (i. e. stemming from customs and not statutes). Out of this reform came the Fuero Real (Royal Charter) in 1284. However, it is the monumental Siete partidas (Seven Divisions) that have earned Alfonso the respect of all lawmakers. It drew on a wide variety of sources, the Fuero Juzgo, the Fuero Real, Roman and church law, the Bible, common law, even literature whose moralising could be molded into a guide for proper conduct. Its genesis seems to have coincided with Alfonso’s decision to put himself forward for the title of Holy Roman Emperor, 1256. Alfonso X and Collaborators. From the Siete Partidas. Divided into seven parts, the Siete partidas is an encyclopaedic work the content of which reaches far beyond the confines of law. As well as a code of law, It is a wide-ranging manual of customs and a guide of social expectations and behaviour. The first partida, for example, has a discussion on burials, the dimensions of a cemetery and how near to a church it should be, who could be buried in a church, why knights killed in tournaments were excluded, burial expenses and why valuables should not be buried with the dead. The partidas set out, too, the full powers of the king, his right to issue laws, do justice, strike money, declare war or peace, establish taxes, fairs, appoint governors, delimit provinces (Hillgarth I 298). There was resistance to the king’s authority from the nobility and towns, wedded as they were to their particular privileges and fueros, and it was not until well into the 14th century that the Partidas were finally made law in Castile. 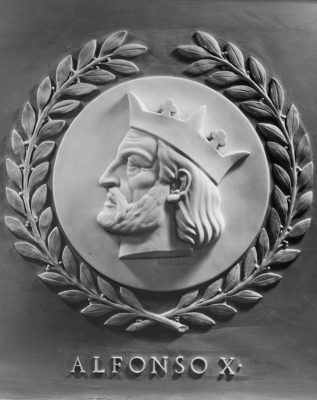 Recognition of Alfonso’s contributions to the codification of laws can be found in a marble relief bust over the gallery doors to the US House of Representatives; his is one of twenty three recognised as the greatest legislators in world history. Note on Language: At the same time that Castilian was being promoted by Alfonso, Catalan was being advanced in the east of the Peninsula with the conquest of Valencia (1238) and an expanding empire in the Mediterranean. Although technically all this was undertaken by the Crown of Aragón, the driving force was the House of Barcelona, the dynastic name for Catalonia. Linguistically, too, Catalan was enriched by the enormous output of the multifaceted scholar, Raimundo Llull (1232-1315), author of e. g. Blanquerna the first major literary work in Catalan. The linguistic minorities of Spain –notably Catalan, Basque, Galician– have long fought against the assumption that Castile is Spain. Their objections form the core of the struggle between centralisation and diversity especially since the country’s decentralisation following the death of the dictator, General Francisco Franco in 1975. Burns, Robert I ed Emperor of Culture: Alfonso X the Learned of Castile and His Thirteenth Century Renaissance Philadelphia 1990. Gies, David T ed. The Cambridge History of Spanish Literature Cambridge 2009. Hillgarth, J.N The Spanish Kingdoms 1250-1516 Oxford 2 vols 1976,1978. O’Callaghan, Joseph The Learned King: The Reign of Alfonso X of Castile Philadelphia1993.